CANADA: Energy company Emera has launched a solicitation for wind and hydro supply to be delivered south to Massachusetts, a plan that will finally test the feasibility of what Canadian wind energy producers have long imagined could be an important new market opportunity. "We've been talking about wind-energy exports to the US for a while, and now with this, and I think with other projects out there as well, it becomes real for the first time," said Jean-Francois Nolet, vice-president of policy and communications at the Canadian Wind Energy Association (CANWEA). 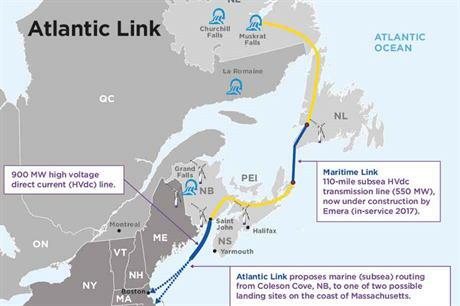 Emera plans to bundle the energy with transmission services on its proposed Atlantic Link, a 570-kilometre, 900MW HVDC subsea cable originating in Coleson Cove, New Brunswick and ending at one of two potential landing sites in Massachusetts. The Canadian company will bid the final product into a Massachusetts clean-energy request for proposals (RFP), expected by April. The US state passed legislation last year requiring utilities to procure 9.45TWh of hydro, new renewable-energy capacity, or new renewables firmed by hydro. The bill makes it clear the state will give preference to proposals that combine both, but that is not the only reason Emera is looking at a hybrid product. "We think wind bundled with hydro can be very attractive from a price perspective," said Gerald Weseen, Emera's vice-president of US government affairs. The region faces the retirement of significant coal and nuclear resources and wants to avoid relying too much on natural gas. This makes a firm wind-hydro product a viable option "if you're a purchaser looking to replace baseload generation that's coming offline", he added. The economic case for combining wind with hydro is enhanced by the fact that wind qualifies for renewable-energy credits, currently trading in the mid-US$30 range and expected to increase in value as the production tax credit (PTC) phases out, while large hydro does not qualify. That income stream, combined with dramatic drops in the cost of wind, is increasingly capturing the attention of hydro producers, which have historically exported about 10% of their output to customers in the US. A likely source of hydro for the new line is the 824MW Muskrat Falls project now under construction in Labrador. The wind could come from facilities in any of the four Atlantic provinces or Quebec, Weseen said. Projects in northern Maine that can deliver electricity to the Atlantic Link DC converter station in New Brunswick would also qualify. Emera's deadline for proposals is 12 April, with winners selected in May. Emera has thought for some years that there was potential to use wind energy from eastern Canada to supply the New England market, said Weseen. A study conducted for CANWEA last year by consulting firm Power Advisory found that even with the US's PTC subsidy, wind from Atlantic Canada can compete with local New England projects, mainly due to the higher capacity factors north of the border. Siting and permitting projects is a challenge in the densely populated north-east US. In northern Maine, which has some of the region's best winds, development is stymied by a lack of transmission access to load centres to the south. "In New England we only have about 1,000MW of wind, and even with this limited amount of wind penetration we're having major issues with respect to transmission congestion," said John Dalton, president of Power Advisory. Emera's Atlantic Link is looking to avoid the congestion and deliver power to where it is needed, said Weseen. But there are at least 12 transmission projects under development designed to deliver clean-energy resources to the region, many of which are expected to bid into the Massachusetts RFP.